If you have small holes in a wall – say, from the nails where a painting used to hang – there’s a simple, cheap DIY way to hide them. 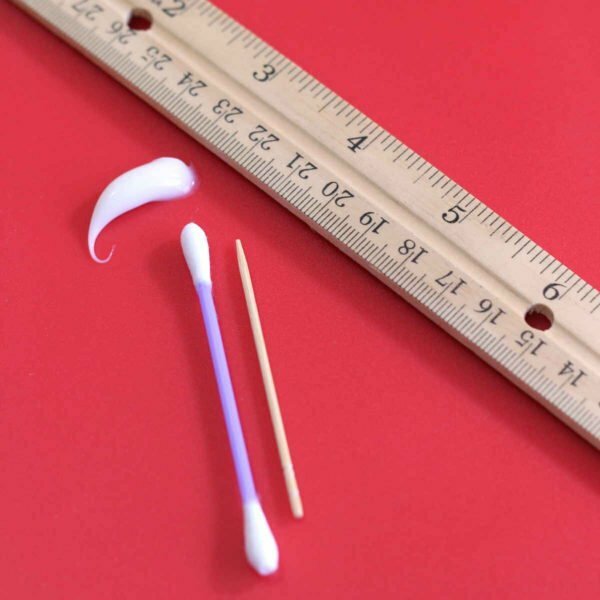 It involves a toothpick or Q-tip cotton swab, a straight edge of some sort – and white toothpaste. Why not just caulk, sand and paint? The “real” way to fix a hole in the wall is to shoot some caulk or spackling into the hole, let it dry, sand it with fine sandpaper to make it flush with the wall, and then paint over it if needed. You may be wondering, why not do this method? It’s not all that difficult. That’s true, but the method I’ve discussed here is something many of us can do with just what we have on hand. It’s true that caulk will last longer than toothpaste, but unless you stick another nail into the toothpaste, it will keep that hole filled for a very long time, and be very unnoticeable. So if you’re in a hurry, or you can’t afford to go buy some spackle, sandpaper and paint, this is another option that really will work! Keep in mind: this will only really work with very small holes. Like the ones left by small nails used to hang pictures or calendars. If you have a sizable hole, you really need to get some caulk and do it right. If you try to do this with a big hole, sometimes the toothpaste will shrink over time. Then it leaves a small hole or ends up falling out altogether. Squeeze some white toothpaste onto your toothpick (for really tiny holes) or Q-tip (for slightly bigger ones). Push the toothpaste into the hole in the wall with your toothpick or Q-tip. Spread a little extra toothpaste around the outside of the hole to make sure you don’t have any gaps. Use your flat edge (a table knife will do nicely) to make the toothpaste perfectly flush with the wall. Fix the color to match the wall. If your walls are white, then at this point the hole should be invisible. But chances are, your walls aren’t white. So now what do you do? Apply some kind of pigment that’s the same color as the walls. If you have art supplies on hand, that’s perfect. Even crayons, markers, or colored pencils in the right shade can do the trick. But if you don’t have any art supplies, cosmetics are also great for this. Many liquid foundations will cover on a beige or almond wall. Lipsticks are great for color – even wild colors – and you can buy cheap ones for 99 cents at most drugstores (in the US). Eyeshadows can also work well and have a huge range of color. But since eyeshadows aren’t liquid, you want to wait until the toothpaste is fairly dry (just a few minutes, typically) and gently pat the eyeshadow onto it until you get the desired color. Colored pencils, crayons and other art supplies can also make the color match. Basically, anything that’s liquid or wax and has pigment will work. I’ve had patches like this last for many years. In fact, I’ve never had one crumble or fall out. It’s possible your mileage might vary depending on the brand of toothpaste you use, but for very small holes, I think this works even in the long term.